Contact Us & Who Are We? Please review our newly produced video demonstration (click on the link above), which will show you how quickly GenSuite can be built, transported, installed and operational. We hope that you will be impressed enough to make contact, so that we can discuss your requirements. We look forward to hearing from you. 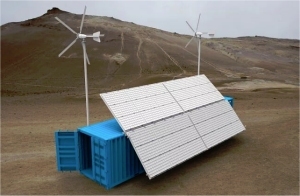 High Yield Energy designs and manufactures an innovative renewable power solution, GenSuite, which can be deployed in a wide range of situations, being mobile and easy to install & operate. It is ideally suited to providing energy in off-grid locations and emergency events. 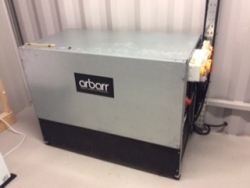 It is currently manufactured in Northern Ireland and its design integrates specifically engineered, on-board components to deliver renewable energy to services and devices installed within the unit. We have designed GenSuite as a robust and mobile energy centre, in a self-supporting building that doesn’t require foundations. It is based on a customised high-cube shipping container (40 feet x 9 feet 6 inches/12-metres x 2.4m); other container dimensions are available, if required. GenSuite incorporates a wind generated option, provided by a 5-bladed turbine mounted on a 7 or 10 metre monopole, producing 3kW in accordance with customers’ requirements. The solar option comprises up to 42 photovoltaic cells; these are mounted on an external matrix framework designed in-house. The matrix can be hydraulically folded away for safe transportation. We can also deploy additional ground fixed PV panels where additional power is required. In combination, the power elements that we have incorporated in GenSuite can deliver up to 16kW of electrical energy. Internally, the generated energy is stored in a battery-based system, which distributes the output in accordance with the customers’ requirements. In addition, we offer the option to install a diesel generator, to perform in a back-up function to the renewable components. We can customise the main features of GenSuite to match customers’ requirements.